Using Tilt Correction, GLONASS, GPS and EGNOS to obtain a true ground position, even on rolling ground. Our services include Tillage, Forage Harvesting, Dung Compost Spreading and Hedge Cutting. We are Agricultural Contractors based in Thurles, County Tipperary. We provide Top Quality Agricultural Services throughout Tipperary and surrounding counties. 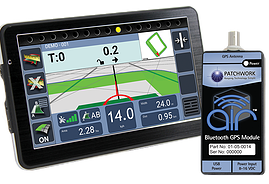 Stocking full range of Patchwork Blackbox GPS systems, BFS sprayer parts. Traffi-Cam is a new and unique vehicle safety device designed to allow an operator to have full vision before entering on to a busy road.